New York City Art Deco forerunner Ely Jacques Kahn (1884-1972) would have been nothing if it weren’t for the few formative years spent at Paris’ hallowed École nationale supérieure des Beaux Arts (National Superior School of Fine Arts); from 1908-1911. Contributing to Midtown Manhattan’s 1910 to 1930 building boom, the architect conceived more than a dozen high-rise office and loft-style buildings, introducing set-back and carefully ornamented facades. Throughout these prolific years, Kahn’s early affinity for French Neoclassicism and the American, appropriately named, Beaux Art style moved into Modernism. All the while, Kahn’s strategic use of luxurious materials, such as marble and terra cotta for industrial-scale buildings indicates something of a transcended aesthetic. Before helping to shape New York City’s grand style with such contributions as the 1927 Bergdorf Goodman Building or the 1929 Film Center, Kahn’s years in Paris brought him into contact with Rodin, Cubism, the Ballet Russes, and Gertrude and Leo Stein (personally as much as their published writings). Though not at the cutting edge of these cultural changes and more in-tune with established models of balanced form, intuitive composition and logical planning, residual effects of his exposure to early modernism contributed to mature works in the 1920s. This 1907 poster-sized étude shows a study of Neoclassical space distribution in the tryptic of a facade, cross-section and small floor plan. 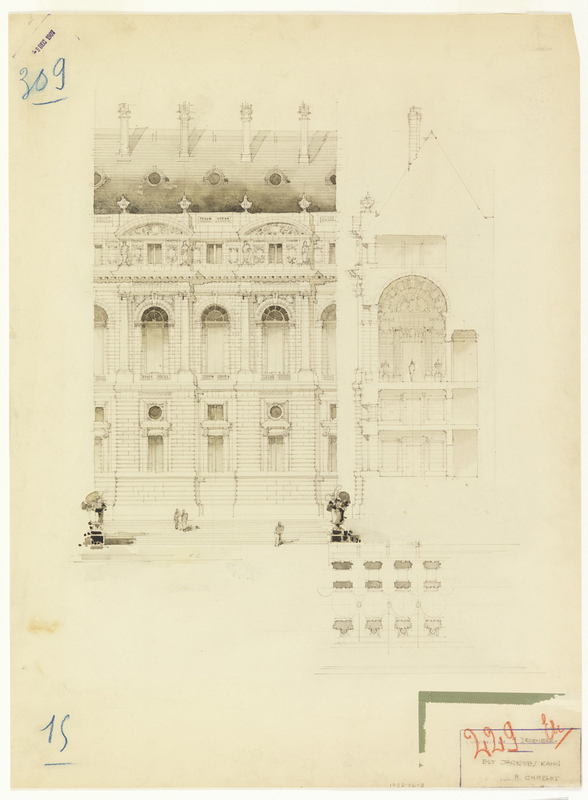 However, the French inscription “concours de 9 Decembre” indicates that this drawing would mostly likely have been part of a school or external competition leading to Kahn’s top ranking of Architecte Diplomé par le Gouvernement Francais (Architect named by the Government of France) in 1911. Kahn, Ely Jacques, Françoise Astorg. Bollack, and Tom Killian. Ely Jacques Kahn: New York Architect. New York: Acanthus Press, 1995. p. 12. Stern, Jewel, and John A. Stuart. Ely Jacques Kahn, Architect: Beaux-arts to Modernism in New York. New York: Norton, 2006 p. 37. Drawing, Design for Several Bays of a Public Building, 1907. graphite, brush and gray wash on bristol illustration board. Gift of Ely Jacques Kahn. 1952-86-3.